Thread: Randy Moss - smells like gold underwear. What's everyone's thoughts on Randy's offseason? For those that don't have their finger on the pulse, reports out of SF couldn't be any better. Literally. SiriusXM NFL Radio’s Rich Gannon says 49ers coach Jim Harbaugh believes Randy Moss has been the team's best receiver this offseason. Per Gannon, Moss has been sitting in the front row at team meetings, and making a positive impact on San Francisco's younger receivers. Moss has been drawing praise from 49ers coaches all offseason, and for the moment at least, sounds supremely motivated after sitting out/going unsigned in 2011. JI was its usual crass, juvenile self when last Randy was discussed. "Worst WR ever, blah blah blah" type remarks. FTR; the biggest question that enters my mind? Will they actually be able to utilize Randy's strengths. Alex's Stroganoff arm won't be a threat to get Randy his trademark throws. I expect Alex's fame to expire in September when he returns to form as a busted QB. Enter Josh Johnson (Jim's old homeslice) who's got a wicked pisser of an arm. Last edited by Paradis; 07-09-2012 at 05:38 PM. There's some speculation on my part here, yes. Randy Moss is the greatest WR I've seen outside of Jerry Rice. In 2009 Randy Moss put up 83 receptions, 1,264 receiving yards to go along with 13 TD receptions. The following season, he only put up 16 receptions for 393 receiving yards and 5 TD receptions. Some say, because of 2010, that he's "done". I always keep in mind, that Randy was forced to play with 3 different teams, so of course he had a career low type of season. After sitting out all of last season, I think at the age of 35, Randy Moss can put up monster numbers with SF. If anyone can return at the age of 35 in regards to putting up a strong season; it's Randy Moss himself. These are the last years of Randy Moss, I think he want's to go out the right way, enjoy the game of football (that he'll never be able to play again) and overall... Just enjoy his way into Canton as a future HOF WR. The reasons why Moss is sitting in the front row, being a positive teammate/example, is because he's trying to soak up everything the game has to offer before retiring, including being a good teammate. But at the old age of 35 (football wise) the end is near, he's on the verge of near retirement; hopefully he goes out with a bang. I love the off season. Harabaurah also thinks michael crabtree has the best hands he has ever seen. I mean, lets take this with a grain of salt. Moss is old. He will have an ok season but hes not a top receiver anymore. I wouldn't feed it to your dog. The proof is when they start playing for real. ( what will you say if hes a dog when the season starts) You remember when Jets had Chad Pennington. How many times reports were his arm was much stronger than it ever was. Than the season started and those report proved inaccurate. THe question with randy Moss will be when he not the intended target will he give 100% effort to sell it or will he coast and let the defense know the ball going some place else. The 49ers better hope they don't have a rough start because it could get real ugly with a Randy Moss when things aren't going well. You really do have an inferiority complex, don't you? I always keep in mind, that Randy was forced to play with 3 different teams.. 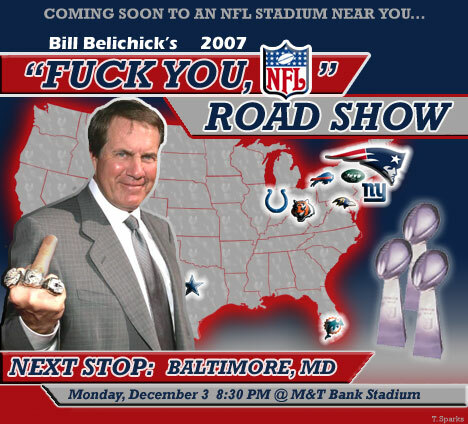 He begged out of New England, got his way. Then proceeded to wear out his welcome in a matter of weeks in Minnesota. So NOW hes geing a good citizen? That's a pretty accurate description of Moss' 2010. I don't know what's wrong with him, and I don't think anybody else does either. Clearly some sort of personality disorder. If he really wants to play this season and try his hardest, he can easily put up 1,200 yards and 8 TDs, even at age 35. The big question is "if." It sounds like he's back in a good mood and motivated to play after a year without football. Good for him. Eventually it will end badly, though... it always does. Question is whether or not the Niners can get enough useful production out of him before it does. The asterisk and 18-1 don't really go together. Makes it seem like you are dissing the Giants instead of your intended target. Just sayin' . . . .
Another thread awesomefied by the jackals of JI. JI was its usual crass, juvenile self when last Randy was discussed.